Let’s face it, we’ve all had the fantasy. It’s different for everyone. Me? I don’t picture Ed McMahan (is he even still alive?) 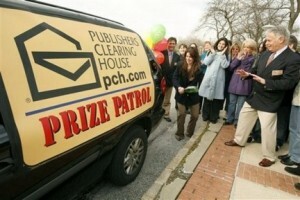 showing up at my front door with a big check from Publishers Clearing House. That’s kind of flashy and public and, frankly, not my style. My get-rich fantasy is more like the one in Office Space (minus, you know, the embezzlement and whatnot). I picture simply checking my bank account, only to find a huge number where there’s usually a pretty darn small one. *dreamy sigh* Yeah, that’s how I’d like it to go down! If you had unlimited funds, would you still take the self-publishing route? Or would you spend your time going after a traditional publishing deal? If you did choose to self-publish, would you choose to DIY the various components (editing, design, marketing, etc) or hire it all out? In which area would you invest the most your money? How would it change your writing schedule? What about your writing space? Would it alter your sales goals? What about the type/genre of books you write? Considering how much I hate marketing, I would hire an expensive New York marketing firm and a top-of-the-line publicist to get my work out to the masses. I’d still self-pub and I would outsource the tasks I don’t have the time or inclination to do and just write! Thanks for your perspective, KG! I have a feeling many other indies would have the same inclination — out of curiosity, is there a type of marketing you hate LESS than the others? I would still self publish, but I would take more chances in the publicity and marketing stages. For instance, without an unlimited cash flow I can’t risk the cost of travelling to as many conferences and trade shows as I would like because there’s guaranteed return in book sales. That goes away with a bigger budget. I would also experiment more with app creation, videos, fireworks, acrobatics, the whole nine yards. Oops — I meant there’s no guaranteed return in book sales. Isn’t it fun to imagine all the stuff you could do? Sigh. I know we’d love to be able to go to conferences and the like…sigh. Maybe we could organize some online conferences for we poor/stationary folk? I’d hire it all out. I’ve done everything from editing to book covers to marketing all on my own (oh, things I’ve learned). But I would still self-publish because I’m proud to say I’ve done it myself. There is definitely a sense of pride that comes with self-pub! Even if you hire out all the components, it’s still your book that you totally published yourself. What would you say is the best thing you’ve learned from doing it all yourself? I would make a few major changes to my business model if I had the freedom that lots of money provided. First of all, my release schedule would slow down a bit. While I refuse to ever sacrifice quality for speed (see my Indie Writer’s Pledge of Quality for more on that http://onthebird.blogspot.com/2011/11/whats-with-all-self-pub-hate.html), as a relatively unknown indie I feel a need to keep new stories coming out at a relatively rapid pace in order to keep getting my name out there. Second, I’d feel less need to fit my work into established market niches. Don’t get me wrong, I write the stories I want to write, I refuse to simply write “clones” of popular genre works. But at the moment, I do so by taking familiar genres and mixing them in unusual ways (for instance, Atticus for the Undead, an urban fantasy story meets Law & Order http://onthebird.blogspot.com/p/legal-fiction-series.html), or taking familiar tropes and turning them on their heads (for instance, Weaver — girl meets the boy of her dreams, but that’s a BAD thing, since the dream involved him killing her http://onthebird.blogspot.com/p/weaver-saga.html). I think I’d feel more freedom to do things that were completely fresh if I had more money. And third, I don’t think I’d ever give up marketing entirely — I actually enjoy interacting with my readers/potential readers, and I (usually) enjoy updating my blog (if you hadn’t already guessed, that’s http://onthebird.blogspot.com). But as KG Garyson said, I’d hire a major firm to help out. They could probably do it better and certainly reach more people! Fabulous response, John! It’s great to hear from an author who enjoys marketing (actually had a post on that today, as a matter of fact). Thanks for sharing your perspective (and your blog — excellent posts)! Ahh, the control that comes with self-pub is very alluring. Which non-writing part of the indie publishing process do you enjoy the most? It’s a good question! Money has never been my prime motivation in life, but work has, so while oodles of cash would bring much welcome security, it would change me as a writer, or more importantly make me a better wordsmith! I think though, I’d probably go the self-publishing route, simply in the interests of expediency! Thats a interesting question, even if I were wealthy I would still self publish and probaly spend the time and money on getting a good editor and marketing. Love you indie spirit here! The discussion this question has sponsored is awesome, isn’t it? I’m really encouraged to see how many of us would still self-publish, albeit with a few more of those helpers you mentioned! I would still self publish, but I would have a larger marketing budget! A large marketing budget would be awesome! What would your dream marketing campaign be? I would definitely still self publish, but as KG said, I would hire someone to do my marketing. When I started writing a few years ago, I never thought that writing the books would be the easy part! It’s crazy to think that the months or years you spend writing that book would be the least of your worries, isn’t it? We hope to be able to provide more and more marketing resources to make that part of the equation as minimally painful as possible!